Here a small video how i change our nozzle in a few seconds. Hier ist ein kleines Video, wie ich die Düse unseres Hotends in wenigen Sekunden wechsle! Beim Material handelt es sich um ABS. 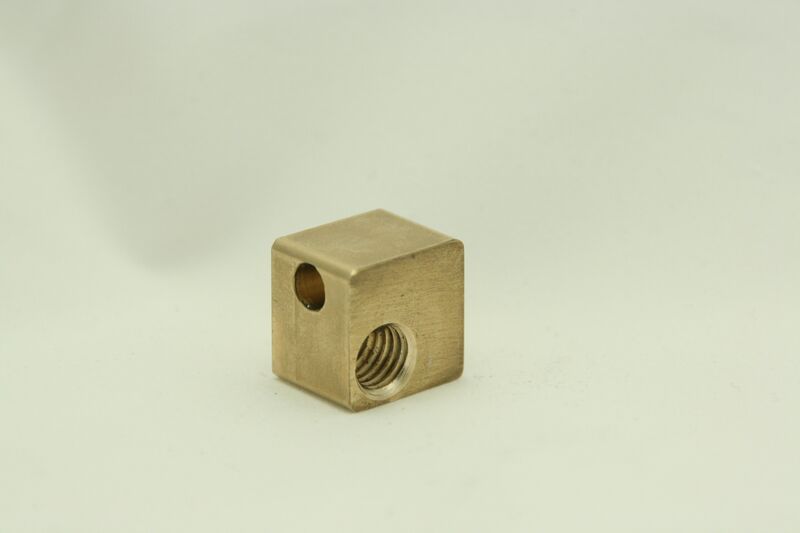 no boring stuff… the hotend is really important for the 3dprinter. 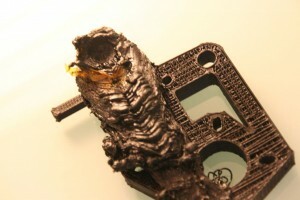 The hotend is the mainpart why a 3d-printer with plastic works so well. 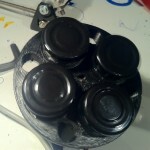 First we started 3d-printing or repraping we bought some hotends in different shops, to check out how they work. 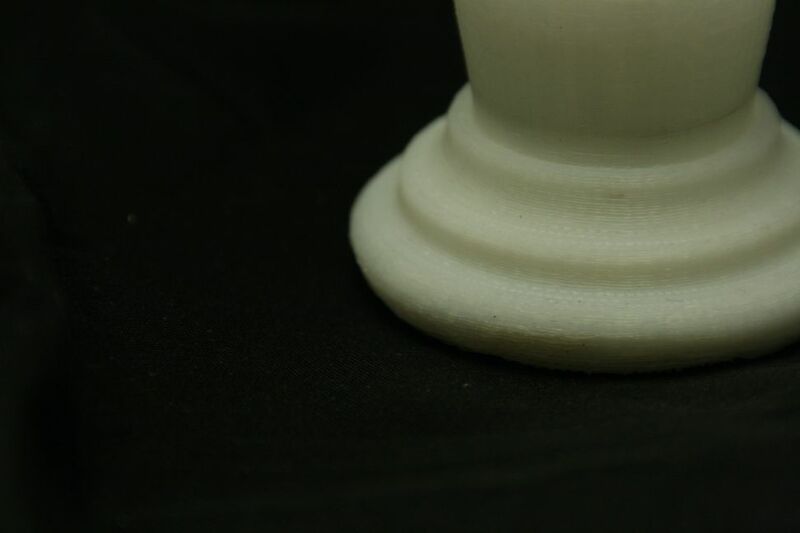 Printing PLA was the most of the time no problem. First prints with ABS where horrible. Firstlayers wasnt really strong. Most of the time we dont get the right temperature. So we print about a week direct in the trash-can. 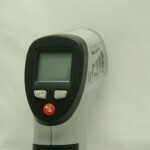 At our visit at a big electricparts-shop in our city we found a infrared temperaturemeasure gun about 20-30Eur. 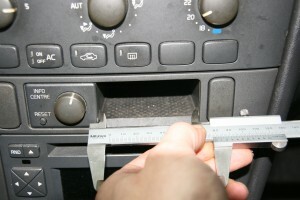 Temperature area -30 to 260°c. Maybe not so accurate, but for measure the hotendend and estimating how hot it is… its enough! Back at home… spending the hole evening meassuring of all hotends we have. Surprised we see that the most of the hotends dont have the temperature at the outcase that was displayed in the Print-interface. So we were missing about 20°c to print ABS. >230°c was the temperature we wanted to have. 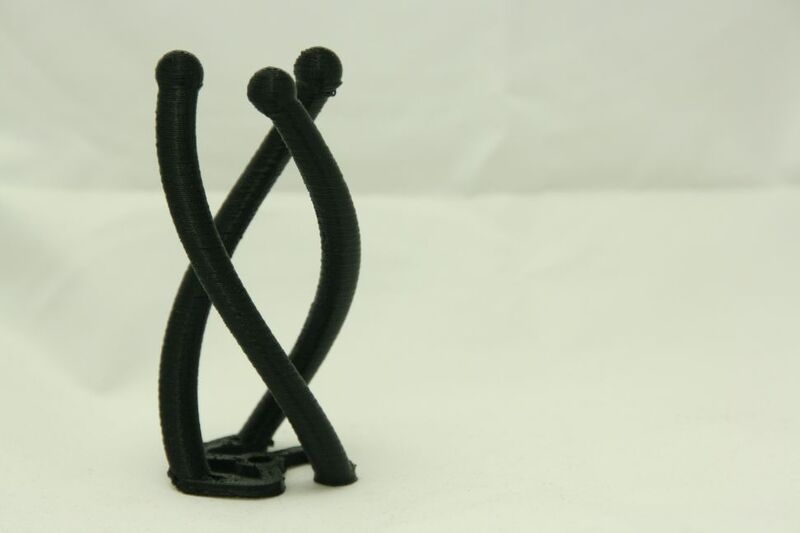 So we set the temperature higher until we see that the ABS-filament comes with good speed out of the nozzle. I think the perfect printtemperature for ABS is right before it gets really liquid. At starting my printer and setting it to temperature, i extrude a small ball of filament and squeeze it between my fingers. 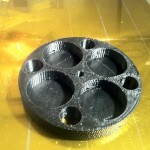 For a few days it works pretty well and we tried to print full ABS-sets. After printing 55% of a set the nozzle gets blocked and we throw another set in the trash-can. 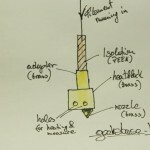 Okay no more stupid stuff lets develop our own hotend to learn how it gets better! In my regular job i am a metal cutting mechanic and so drilling milling and turning of miscellaneous materials is no problem. 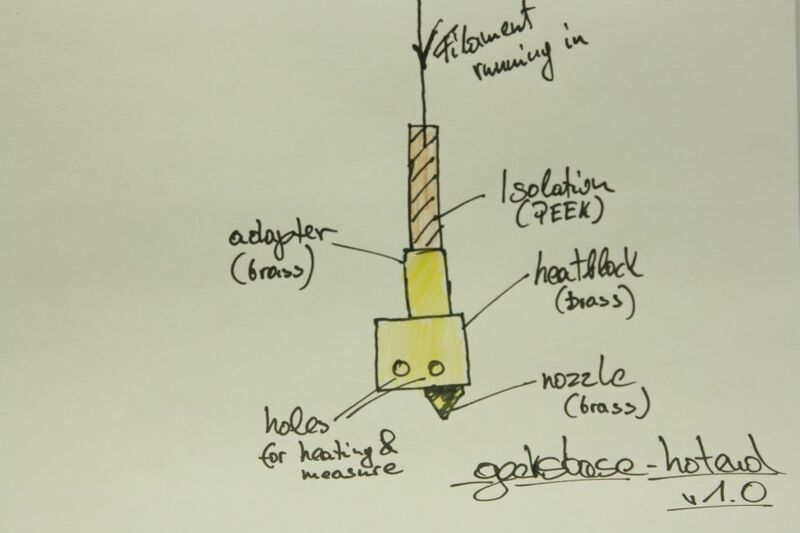 For the most parts we decide to use brass, especially for the nozzle. 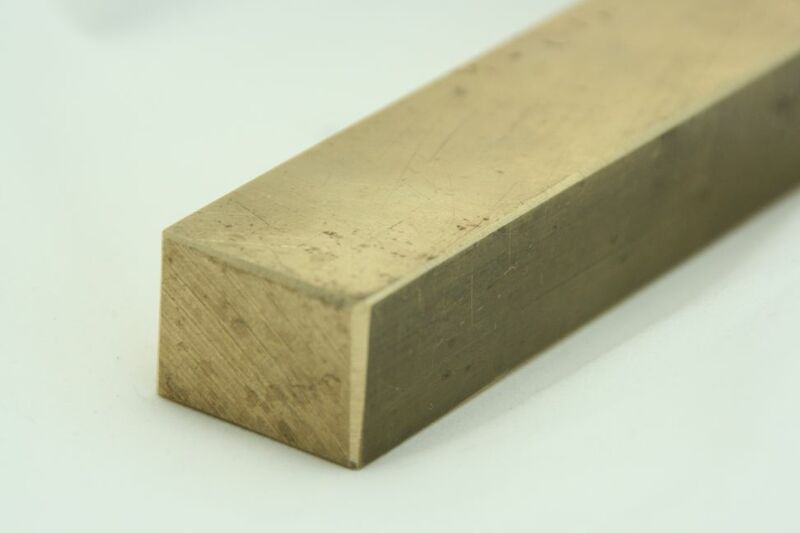 Brass is a wear resistant material. It melds about 900-950°c. Okay brass ready.. somewhere in the garage..
Next we need something to isolate the hotend from the extruder. 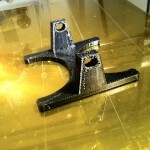 Furthermore its important to hold the filament really cool before it comes in the heatzone of the hotend. 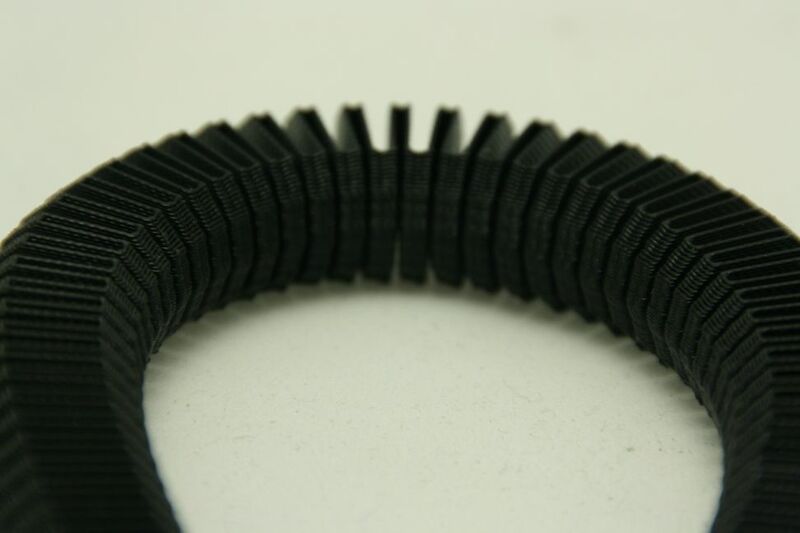 PTFE has high sliding performance. 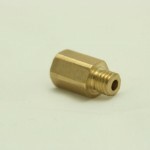 Perfect for the infillarea of the hotend. Some tests … only waste… doestn work! Bursted hotends! Melting hotends. Ah i forget.. some table-sets for the trashcan. Looking in some books from my regular work makes it clear. 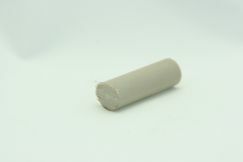 PTFE has a tensile strengh of 10 N/mm². So we decide to start some research and find a better material. 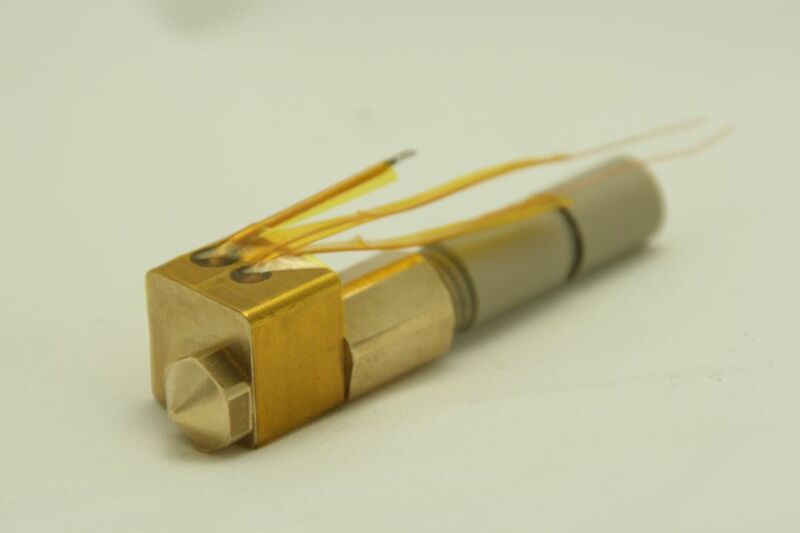 Peek (polyetheretherketon) has a Temperature area about -65 to 260°c. For short times up to 300°c. Nine times stronger then the PTFE. Also it got good sliding performance. I will save all the experiments and the fotos of them and will show you some finished work! 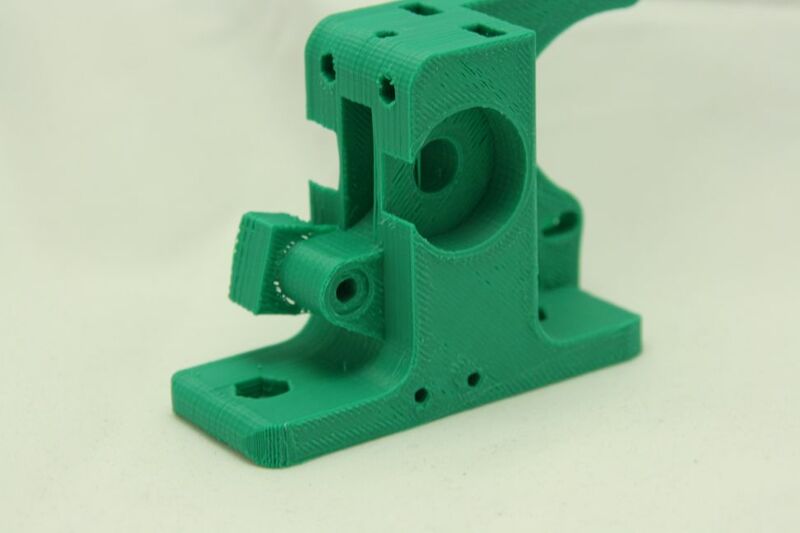 We want to build a hotend which works with PLA and ABS. It must be possible to change the nozzle in a few minutes. 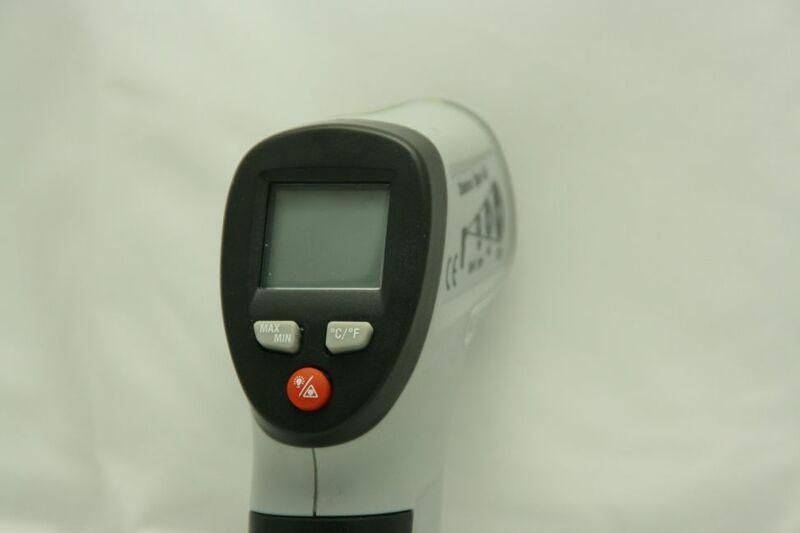 Heatthermistor and Heatsensor must be replaceable too. 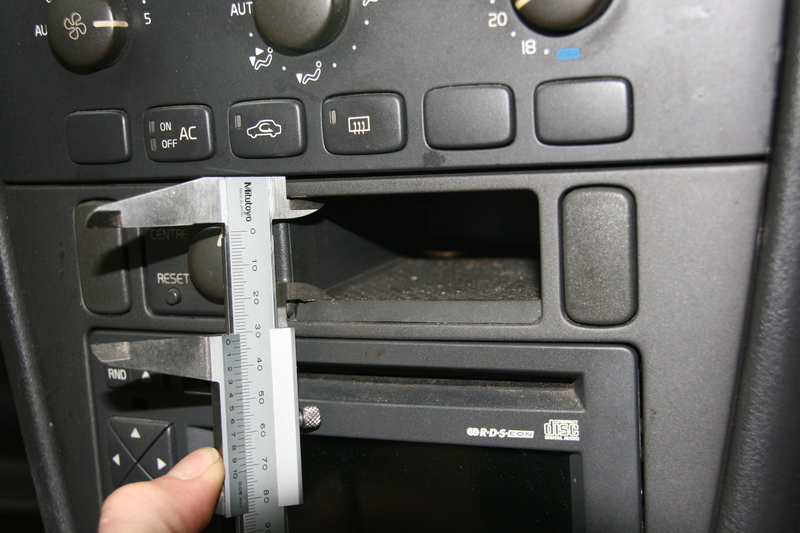 Replacing and dismounting should be easy. The hotend will be designed for a max. working temperature of 260-280°c, to have some air to the top. 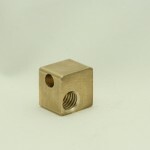 To use the new hotend on all of our extruders, we decide to make the isolation with a out-diameter of 10mm. So it should fit on the most extruders. 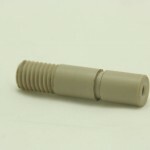 We designed the isolator so that it fits over a thread to the adapter. We make a cut-in to clamp the hole hotend and hold it in position. For 3mm filament we designed the bore thru this part with a dia of 3.5mm. 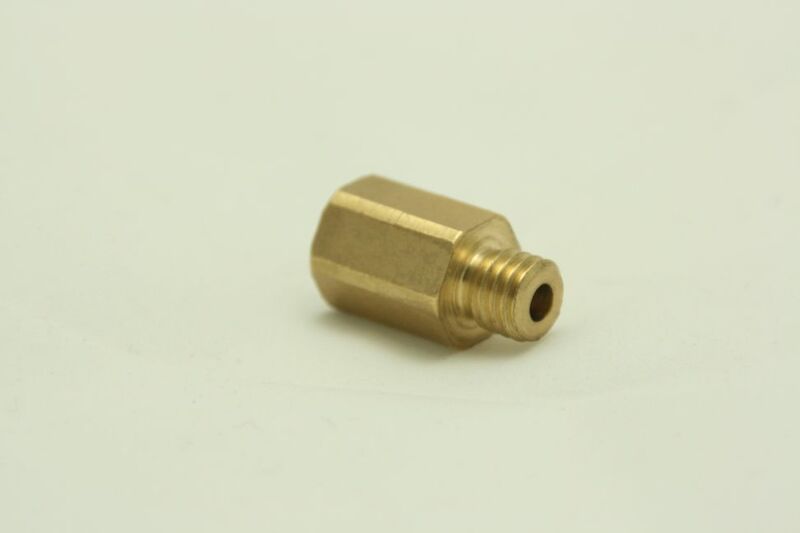 The Adapter is made of Brass. Inside a M10-thread on the outside hexagon for a wrench. So it should be easy to screw them together. 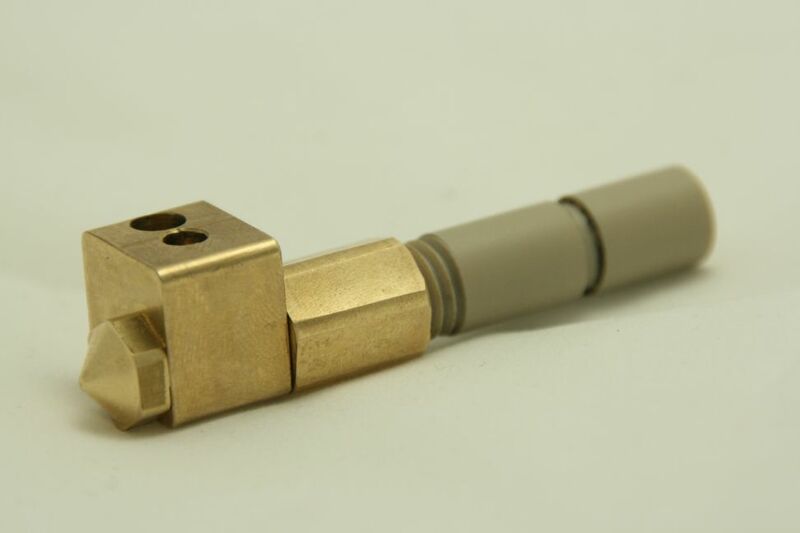 The M8-Outside-Thread is for screwing the isolator+adapter into the heatblog. Threads demonstrat no really fullcontact between the parts. So the temperature wont spread so much. Thats important for the brass but it will save the peek too. 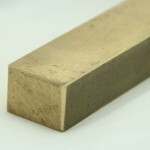 The Heatblock is made of Brass. 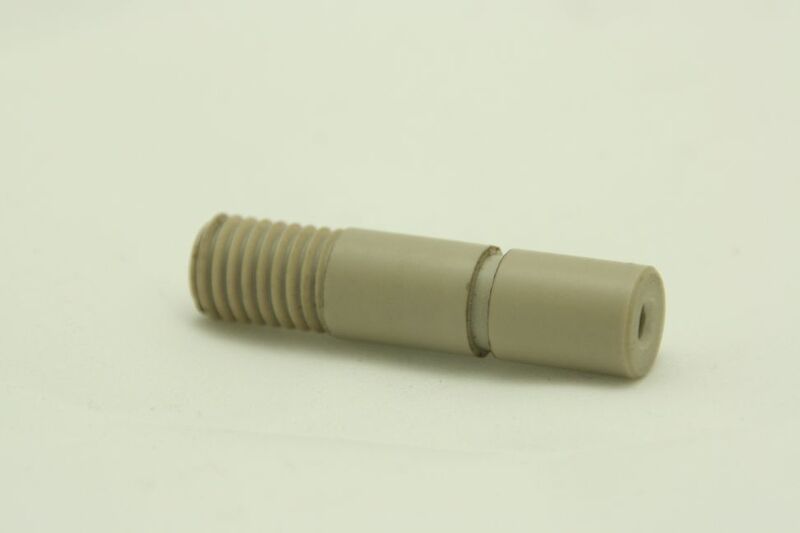 Inside M8-thread to screw in nozzle + adapter. 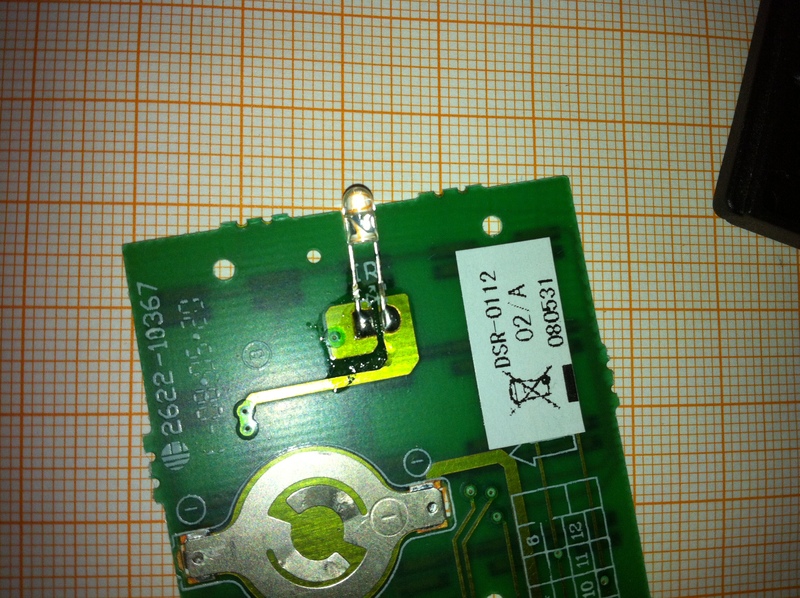 On the side we drill two holes for thermistor and the heat-resistor. 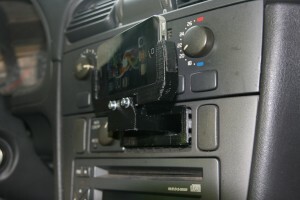 So you have access to them the hole time, if anything needs to be replaced. Made of brass.. i think you guess so! 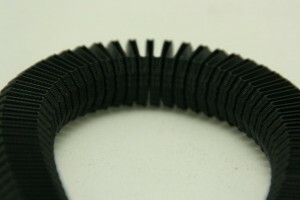 One side have got the M8-outside-thread on the other side its turned to a pointed surface. Inside we made a 3mm bore. 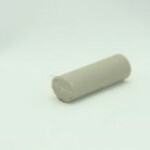 We drill the 3mm bore so deep that only 1mm material left. 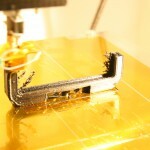 So the material will compressed in this area and only have to get thru the 0.35mm big and 1mm long nozzle. After a lot changes we decide that that works the best! 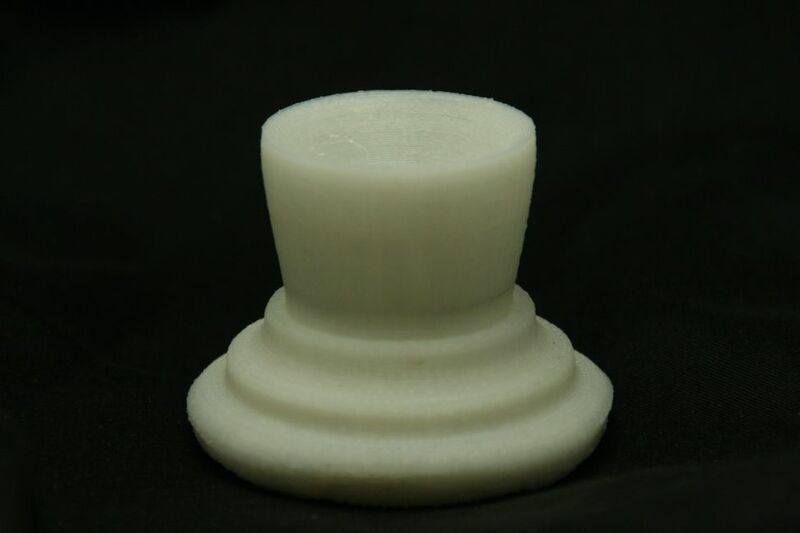 We tried to drill different nozzles.With 0.5 – 0.35 – 0.25 we got great results in PLA and ABS. The isolation works nearly perfect. 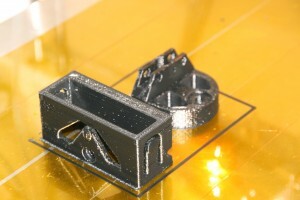 In some cases we try to isolate the hole hotend with a surrounding of capton and mineral wool. 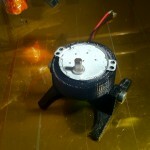 Be warned in the next days i will update this post and will ad some drawings and more information about our new Hotend. Feel free to leave some comments.. ! 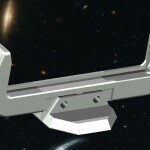 Hello geeks and a HAPPY NEW YEAR 2012! This Year we have big plans and the first is, that our blog-information will be post in german and english! 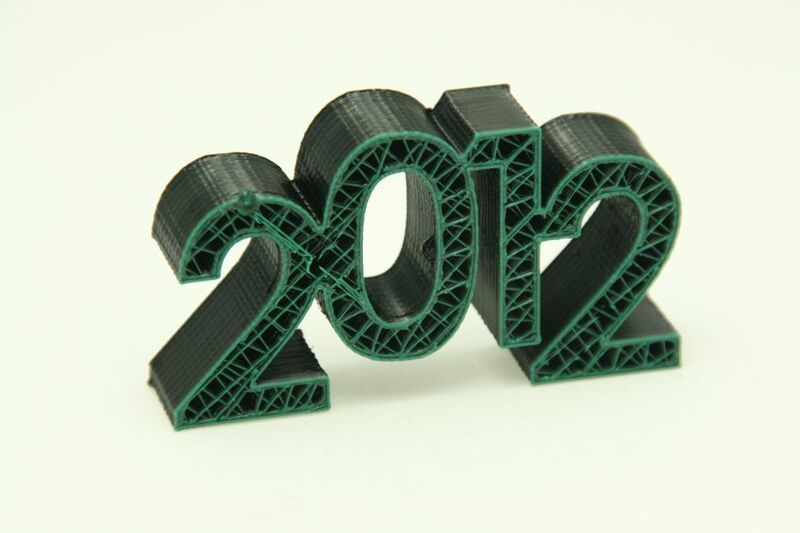 Hallo geeks und ein Frohes neues Jahr 2012! Dieses Jahr starten wir mit großen Plänen und der erste ist, das unser Blog in Zukunft zweisprachig läuft. Grundlegend wir das meiste in englisch gepostet und eine Übersetzung folgt dann. This post, i made because i had a problem. 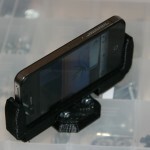 I bought a very expensive toy to use my iphone like a remote control for infrared devices. 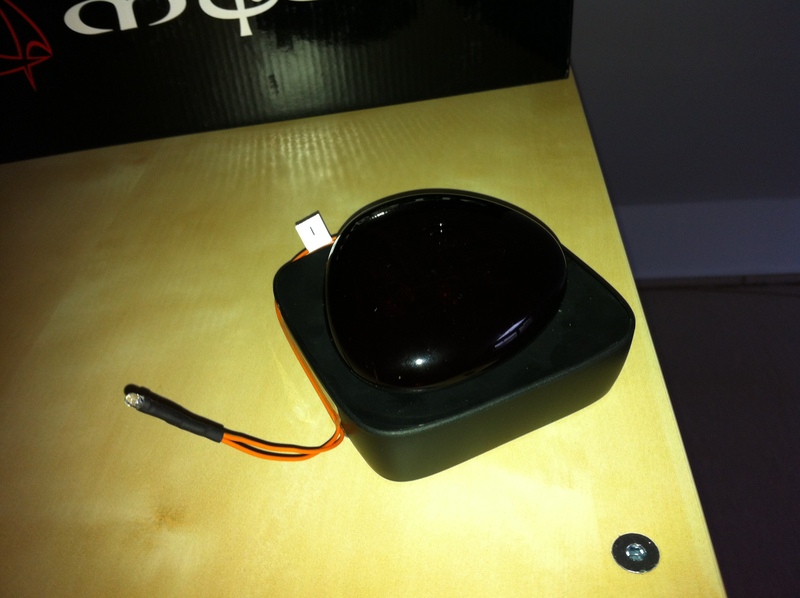 The “beacon it`s called, uses the bluetooth signal of my iphone to convert it to an infared signal and send it to the infrared devices. Everything is cool. I can switch the devices on and of, can change the tv programm, and everything else.But the range wasn´t enough to switch the light on, in front of the room. So i decidet to look for the problem. 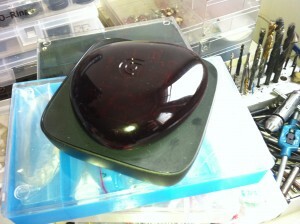 Step 1: I opened the beacon and saw the infared LED´s. Theire direction was set to the front. If the beacon is standing in the room, it only can reach the devices in front of it. I took my torch and connected a wire to one to the contacts of infrared LED´s. With a drill i made a little hole into the housing, where the wire was coming out. Now i build everything together again. 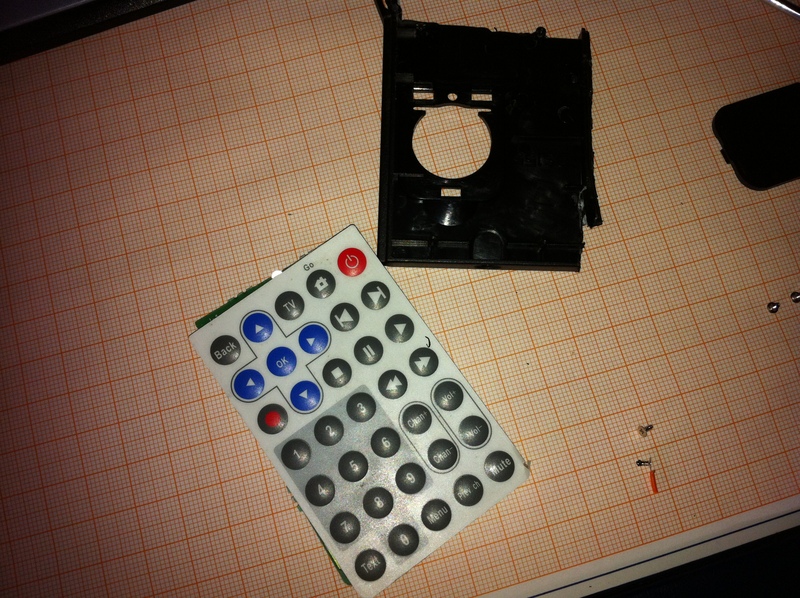 Step 2: Step 2 was easy… I looked for an old infrared remote control. 123 infrared for me, and took the infrared LED from the old remote control. Step 3: Now i took the torch again. I connected the new infrared led with the ends of the two wires. When the device was opened i marked the right polarity. FINISH!!! Now everything is good. I can switch the light on and i can change the tv programm. Of course i can switch on and of the lamp in the front of my room. Everything works great and the problem has gone! Thanks hacking! after cleaning each nozzle by hand for a few months, i come to a new idea. After thinking a while about how to change the problem. I take some of the stuff we had at our lab and build a small Lab-Mixer! Its only used for cleaning 3d Printnozzles. The rotationtable of the labmixer holds 4 glases where each nozzle moves in a solution of aceton. As engine i use a 220v engine with 3 w.
The engine makes 4 rotations in one minute and is fast enough for making the plastic weak in the nozzle. Put the nozzles in the glases of the Labmixer and give some aceton in. After 2-4 hours all the ABS is weak. Now its easy to scratch the ABS out oft the nozzle. 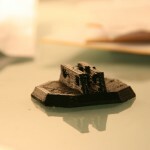 After rough cleaning i hold the nozzles under warm water and wipe them with dry paper. nachdem ich die letzten Monate jede einzelne Düse beim Reinigen immer wieder von Hand im Glas geschüttelt habe, kommt es nun zu einer Arbeitserleichterung. Durch den Geistesblitz und enorm viel Krims-Krams wie z.b. Motoren usw. die bei uns immer in unbegrenzter Menge rumfliegenn…bin ich auf die Idee gekommen eine Vorrichtung zu bauen. Es handelt sich um einen Labormixer für die Düsenreinigung. In dem Rotationstisch werden 4 kleine Gläser Platz haben, in welchen jeweils eine Düse mit Aceton in Bewegung gehalten wird. Als Antrieb nutze ich einen 220V Motor mit 3 W.
Er macht 4 Umdrehungen die Minute und sollte somit schnell genug sein. Der Labormixer ansich bekommt “schräglage” damit die Düsen sich in den Gläsern auch bewegen und nicht nur still daliegen! Also als aller erstes ab ins Konstruktionsprogramm und ein wenig konstruieren. 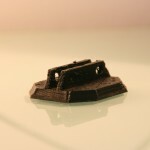 Dannach gleich den 3D-Drucker anheizen und prototypen. Mithilfe des Labormixer benötigen die Düsen jetzt eingelegt in Aceton circa 2-4 Stunden bis das komplette ABS angelöst ist. Dannach kratze ich einfach mit einem kleinen Dental-Kratzer die gelösten Reste raus und Spüle die Düse anschliessen mit klarem Wasser ab. not beliveable… the shaft of my steppmotor brokes in the X axis. kaum zu glauben… aber bei unserem Mendel ist am X-Achsen Motor die Welle gebrochen. Hi Fans! 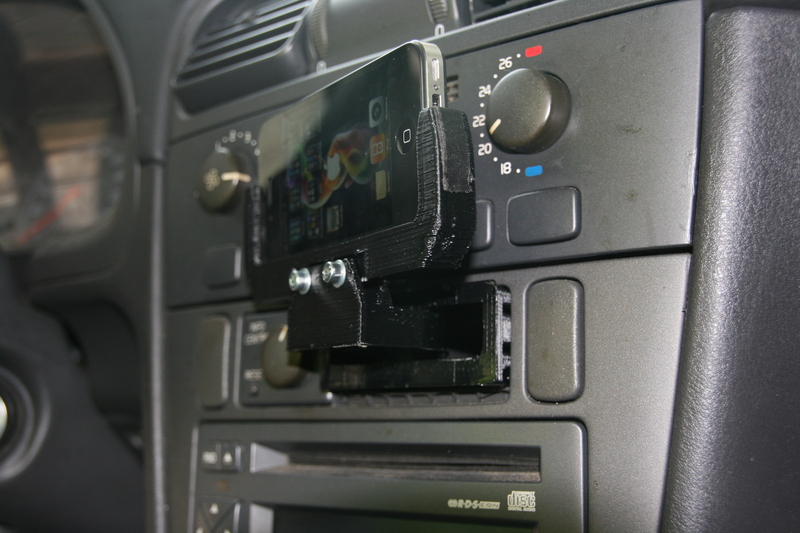 Hab mich mal wieder ans Konstruktionsprogramm gesetzt und mal wieder was gebastelt… Das iPhone Stativ Car Kit. Eine Erweiterung des Stativ Halters. Es hat mich mal wieder genervt. Ich musste mein Telefon die ganze Zeit fest halten während ich mich vom integrierten Navi hab leiten lassen. Vernünftiges Zubehör gibs ja auch nicht bei Apple zu erschwinglichen Preisen. Drucker an, los geht’s! Als erstes hab ich den Telefonrahmen vom letzten mal gedruckt. Diesen habe ich zuvor ja schon mit den entsprechenden Bohrungen ausgestattet um später auch mal andere Adapter anbauen zu können. Während der Rahmen sich schon im Druck befand, hatte ich also etwas Zeit einen passenden Adapter zu konstruieren. 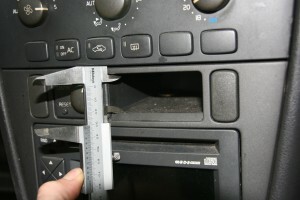 Da in meinem Auto kein Platz für Saugnäpfe oder allgemein glatte Flächen zum anbringen solcher vorhanden sind, musste ich ein Klemmteil konstruieren, welches in ein vorhandenes Fach eingesetzt werden musste. Die Schwierigkeit hierbei war, es waren kaum Kanten vorhanden, an denen man den Halter verklemmen konnte. Also war der Plan Spannnasen in Aussparungen setzen, die gegen die Seiten des Fachs drücken. Das Druckteil wurde immer komplizierter. Da Überhänge und Hohlräume noch Neuland für uns mit unserem Drucker waren, kam es auf einen Versuch an. “Versuch macht Kluch” hat mein Opa immer zu mir gesagt und dieser Spruch hat mich schon echt weit gebracht! Jetzt bin ich wenigstens so schlau um beim nächsten mal keine 3mm Spannnasenhöhe zu verwenden! – Eine is nämlich gleich beim Einsetzen abgebrochen. Also 1,5 mm auf Spannung reicht völlig aus! Das fertige Teil ist jetzt eingebaut und funktioniert prima! Sogar die Schwenkfunktion lässt sich sehen. Bei der Konstruktion hätte ich aber trotzdem beachten sollen welche Bedienelemente die Konstruktion verdeckt. Nun ist Navigieren zwar ohne Probleme möglich, jedoch der Hauptschalter und die Kontrollleuchte für die Klimaanlage sind jetzt verdeckt..
Achso, wenns wen interessiert, die STL Dateien für all unsere Blog-Artikel gibts ersmal nur auf Anfrage, der freie Download ist in Vorbereitung!! Ich hoffe ich hab ein paar Ideen angeregt, man kann alles, man muss es nur wollen! Hi! Da mich das Filmen mit dem IPhone tierisch genervt hat weil alle Videos ständig verwackelt waren, hab ich mal ein bischen gebastelt! Sehr nützliches Werkzeug beim basteln ist da unser Mendel. Eben das Teil konstruiert, hoffen das die Elektronik gerade mit spielt und los!